In the past couple of months, I’ve developed a fondness for plain yogurt topped with granola. I eat it for breakfast or as a snack at least once a day. My favorite granola is Bear Naked Fruit and Nut which costs $4.49 at my Publix. It’s only $3.50 at Walmart, but I don’t shop there very often. 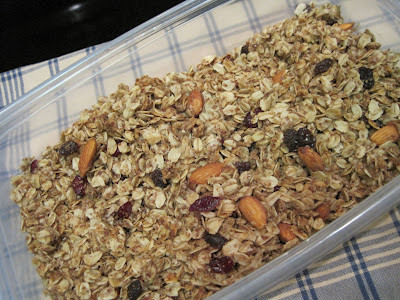 I’ve tried several different granola recipes and this one, which I adapted to suit my taste, comes fairly close to the flavor and texture of what I was buying. 2. Combine the oats, flaxseed, coconut, and almonds in a large bowl. In a saucepan, combine the maple syrup, honey, oil, cinnamon, and vanilla. Bring just to a boil over medium heat, then pour over the dry ingredients and stir to coat. Spread the mixture evenly onto baking sheet. 3. Bake until crisp and toasted, 20-25 minutes. Stir once halfway through. Remove from oven, add in the raisins and cranberries, then allow mixture to cool completely before storing in an airtight container. Admittedly, the ingredients in granola are expensive in themselves, so I haven’t done a cost analysis to see if I’m actually saving any money by making it myself. However, this recipe does make a larger portion than I get in the package at the store. The Amazon link in this post is an affiliate link.